Last year the Echo ran an article about the evolution of the OKC Airpark, located just south of I-40 on Western. The article talked about how the space on the north side of the property promised to become the premier location for upper to mid range size musical acts (think bigger than the Diamond Ballroom, but not big enough for Chesapeake Arena), to perform in Oklahoma City. While the Airpark has certainly fulfilled this promise, hosting nationally celebrated artists such as Sublime, Nelly, The Lumineers and Motley Crue, the buzz surrounding the airpark is not limited to the world of music. One of the most exciting developments happening within the Airpark is the creation of an urban farm on the south side of the property. The owner of the Airpark, Blair Humphreys, has leased a small portion of the land to a group of local organic farmers and over the past year they have been cultivating the land so that it can one day be used to grow large amounts of organic produce. In the meantime, the land is being used to house a small number of pigs as well as chickens. These animals are kept, not only for their naturally produced fertilizer, but also because they will be used to feed local communities. The land is also being used for composting, which helps to enrich the soil and is a large key in the process of successful organic farming. Another lesser known activity happening at the Airpark is the Wheeler Criterium. The Wheeler Criterium is a local biking festival in which bikers sign up to compete in races throughout the USAC (USA Cycling) season, which runs from March 11 through September 9. Races take place every Tuesday evening starting at 5:30. There are multiple divisions to compete in, including men’s and women’s divisions, as well as multiple levels within those divisions. Local food trucks are stationed throughout the Airpark during the races, and attendees are encouraged to support them by grabbing a bite to eat throughout the evening. The races are billed as an all ages event, and attendees are encouraged to bring their families along for the ride. Of course, there will always be music at the Airpark, but there seems to be an evolution in that area as well. 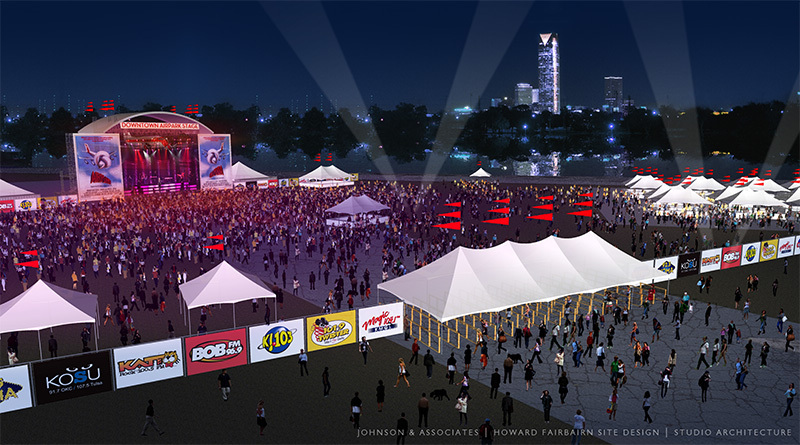 Instead of limiting events to either music or not music, upcoming events are attempting to create more of a festival atmosphere. One such event called the Rollin’ Thunder Rally is taking place May 2-3 and promises both well-known musical acts and raucous fun. The two day event is hosting both Lynard Skynard and Big and Rich, as well as car shows, “freak shows,” stuntmen and an attempt at the Guinness World Record for the largest poker run. The Downtown OKC Airpark is one of the most exciting and versatile venues within the city, and as more and more people realize that this space is great, not just for music but for other activities as well, its process from abandoned airfield to thriving urban event hub will continue.